We all love pizza, right? So when one has success with a “bite-sized” version of pizza, I think Pizza Bomb seems a fitting term. 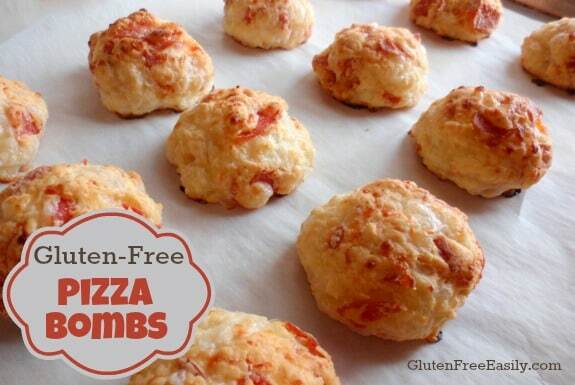 Because these babies are the bomb—Gluten-Free Pizza Bombs! A little background … I’ve been making Kate Chan’s (Gluten Free Gobsmacked) Pao de queijo Rolls, aka Brazilian Cheese Bread, aka Chebe rolls, for a few years now. They were part of my inspiration for my Brazilian Un-Cheese Rolls—my beloved vegan biscuits that are a very popular gfe recipe. And when Kate updated her Brazilian Cheese Bread post and said that she’d been using the same dough for pizza crust, well I had to try that, too. I used that method to make pizza when I adopted her for Adopt A Gluten-Free Blogger. Oh, how we loved that pizza crust! But when it comes to parties, I’m all about finger foods with no utensils and pizza is not often something I’d make for a party. It’s not hard to make, but there are a few more steps than I like to make when I’m in party mode, plus there’s the need for room on an already full table for the pan, a pizza cutter, etc. 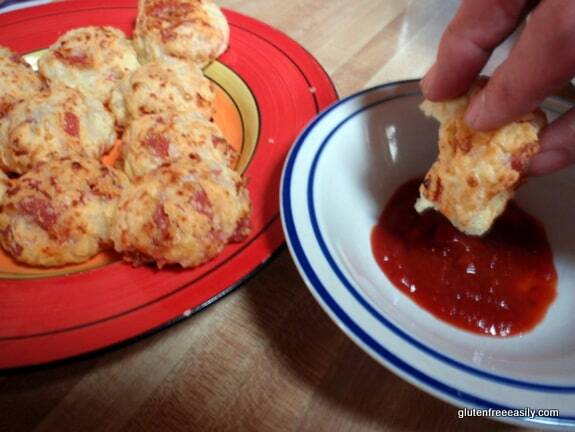 But these Pizza Bombs … now I could do these for any party! Or just for a quick meal for us like today’s lunch. A scrumptious Saturday treat. I’ll be making these to take our family Super Bowl party tomorrow, too. I’m planning to make several versions … pepperoni, mushroom, green pepper … the possibilities are endless! I also want to play around with this recipe and include some pizza sauce in the filling, top some with pizza sauce and a sprinkle of cheese (as I do for my Pizza Muffins), and, of course, try egg-free and dairy-free versions. I believe they will work, but I just have gotten that far with my testing yet. However, I didn’t want to keep this recipe from you guys until then! I want you to make and enjoy these Pizza Bombs and do some of your own experimenting. One more important note … the flour in this recipe is tapioca flour, also known as tapioca starch. Many have shared that they don’t care for the taste of tapioca flour. I, too, used to feel the same way. Then I started using tapioca flour that I purchase at my local international grocery store, Asian brand tapioca flour. It never tastes “off” as other brands of tapioca flour have. It’s important to note that often when tapioca flour does not taste right, it has actually gone bad. Again, I’ve never had that issue with Asian tapioca flour. A one-lb bag costs about $1 at my local store. I know that some have expressed concern about cross contact between products with Asian products … e.g., white rice flour, tapioca flour. 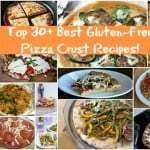 I can’t speak for all of these products and everyone has to make their own informed decisions about using any “gluten-free” products, but personally I have never had an issue with (i.e., reaction to) such products and I have had many issues with a number of U.S. based, self-certified “gluten-free” products and, in some cases, even certified gluten-free products. However, I regularly buy Asian white rice flour, tapioca flour, and potato starch. 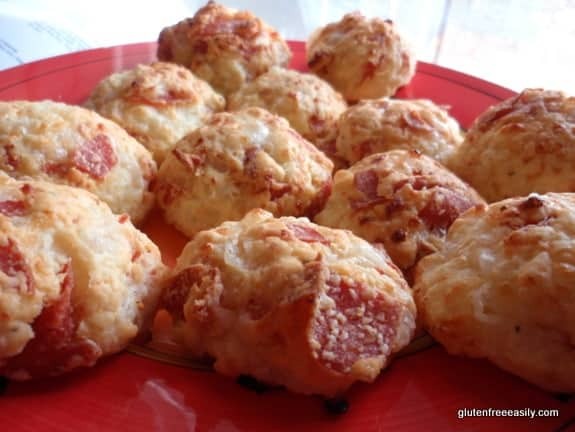 These gluten-free Pizza Bombs are an easy and unbelievably delicious way to get your pizza fix! Preheat oven to 450 degrees F. Line large baking sheet with parchment paper. Add eggs to large mixing bowl. Beat slightly. Add other ingredients in order shown, stirring some after each addition. (Stir gently when adding tapioca flour as it tends to “jump” out of the bowl.) Once all ingredients have been added, stir well until ingredients are fully incorporated. I like to use a wooden spoon (gotta keep up one’s hand and arm strength). With lightly greased hands, form dough into balls about 1 ½ to 2 inches in diameter and place on the baking sheet about 2 inches apart. At this point, you can flatten the dough balls with your hands some if you wish, but I usually just leave mine “as is” to get more of the “bomb” effect (than roll effect). I also think that the centers turn out chewier this way. Bake for about 8 to 10 minutes until golden brown. Let cool just a bit and then remove from baking sheet. Add to individual platter or plates and serve with pizza sauce (or sauce of choice) for dipping. Giving each person his/her own small container of dipping sauce will prevent that always present “double dipping” concern. Makes about 15 “bombs,” about 2 ½ to 3 inches in diameter. I used my kitchen shears to cut cooked pepperoni into smaller pieces before adding to dough. 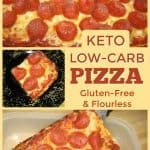 I used dairy butter and dairy cheese to make this recipe, but readers have reported making this recipe successfully using dairy-free "butter" (or ghee) and dairy-free cheese like Daiya Mozzarella Style Shreds. Originally published February 3, 2013; updated November 18, 2017. I think I will make these tomorrow morning for sure! I even have some leftover pepperoni from my chili, I’m all set! Oh, wow! I made gluten free pao de quejo a few weeks ago and they were just okay… But I think the addition of pizza toppings would make them *much* better. Thank you for the idea! What can you substitute with if you don’t have enough tapioca flour? They look so good I want to make them today! I have just over a cup of tapioca starch and I was hoping to avoid going to the store. I’ll play around and see what happens. Pulled them out of the oven about 10 minutes ago and there’s less than half left! My husband’s already planning when I should make them next. These are so good! Hey Susan–Yippeeee! Your report truly makes my day! 🙂 I am always holding my breath until I get at least one positive review from a reader. 😉 What did you do to make up the difference for your slight shortage of tapioca flour? And did you use mozzarella cheese and pepperoni or a slightly different combo of fillings? Thank you again, dear! Those look like they taste just like Totino’s Pizza Rolls! Excellent gluten free re-create! These look so yummy! Now I can make them and have “pizza snacks” for the Super Bowl. Thanks! Hi Leila–It looks like you are new to gfe–welcome! 🙂 I hope you enjoy these during the big game! Hi Shirley – I literally had just over a cup of tapioca starch so I used a tablespoon of coconut flour and potato starch to make up the rest of the 1/4 cup. A friend stopped by and wanted to try one. I gave her your recipe so she can make them for her pizza loving teenage son. He’s autistic and has very specific tastes but she’s very sure he will love this recipe. I can’t wait to see what he thinks. Hi Shirley! These look like the perfect little appetizer — and you know me, ANYTHING pizza and you can count me in! I’ll be sharing them, making them, and reporting back. 🙂 I agree with the tapioca. I get mine at either the local Asian grocer, or at Woodman’s. (last time it was .99 a bag and they were actually stamped GLUTEN FREE) Depends on the brand, but I too have had no issues and am very sensitive. Great places to get rice flours, potato starch and others as well at a much discounted price. Ha, Sarah! Yes, you are one of the pizza queens, so I’m sure you will have fun with these. 😉 I also appreciate your input on the tapioca flour and other products from the Asian grocer. I have read many gluten-free bloggers, “experts,” etc. urge folks not to use such products and I think it does such a disservice to folks. I will admit that I have not had a good experience using all international white rice flours (I’m pretty certain that I reacted to Goya white rice flour), but the Asian ones like the one shown in the post (I’ve added a photo) have given me no problems at all. I ahave always used the ASian flours and East Indianflours and have no issues to date with either of us. I like that they are bagged labelled and dated. The lower price point and availability helps to make it easier to be gluten free. Welcome to gfe, Susan! 🙂 I appreciate your input and very much agree. Personally, I’ve not had good experiences with Latin white rice flour though. It was noted that the company did not ensure gluten free, so I think they know there is cross contamination of some kind. Shirley – these sound delicious! Anything about pizza sounds good to me! 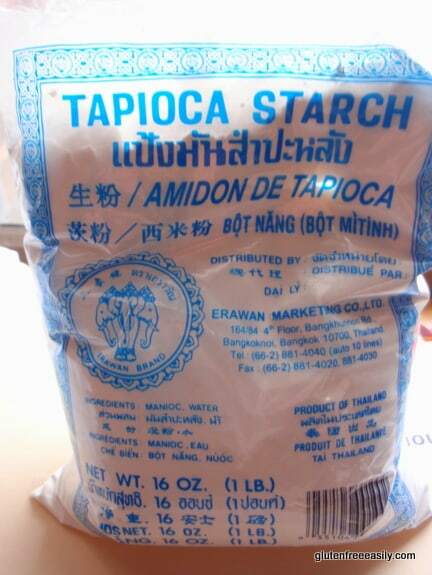 I too buy my Tapioca Starch from Asian sources – cheap and no problems with bad flavors, or any gf issues. Hi Ina–Thanks so much for the feedback on my pizza bombs (I just love calling them that … hehe!) and also regarding the tapioca starch. I think that learning about this source of products could be such great news for many! I think Callum would get a kick out of pizza bombs Shirley! Great idea, I’ll have to get to work on a Callum-friendly version 🙂 I will let you know if we do. By the way, we always use kitchen scissors to cut food – pizza especially! Have a great day! Hope you have a good week, dear! Thanks for taking the time to comment. Shirley, I can’t thank you enough for this recipe. My son loved them and asked to have them every night. He really enjoyed making the dough balls too. I am the GF person in the house and we haven’t had much success with baking that yields super-yummy results – except for some cookies and muffins. We have had our share of GF baking disasters! Thanks for sharing such a yummy and kid-friendly recipe. Can’t wait to try some more of your recipes. Hi Leanna–Welcome to gfe! 🙂 I am just so tickled that this recipe was an instant hit with your son. I am also thrilled that he loves to help you make them. That is really terrific as he’s “vested” in the recipe and how it turns out. Plus, he’ll be able to make these himself one day. 😉 Thank you so much for taking the time to let me know about your success. You might want to give the Flourless Pizza a try, too. Well, I hope you will find lots of great recipes to try. FYI–I’m updating my Recipe Index right now as I just discovered that not all of my recent recipes were automatically making it into the listing. This is a great idea, Shirley! I don’t know why I never thought of it. I might give it a try some time with nutritional yeast for a cheesy flavor. Oh my gosh! My kiddos will love these. What a brilliant idea. I had to laugh at your comment about tapioca flour tending to jump out of the bowl. That has happened to me more than once. In fact, I think it tends more to explode than to jump. LOL Does the dough get really sticky when you are working with it? Hey Kim–So far kid approval rating for these treats has been good! 🙂 I love the idea of your boys enjoying them. They are fun to eat by dipping into sauce and make for really nice chewy pizza bites! Isn’t that the truth about the tapioca flour? It’s just so light. I wouldn’t even dream of using an electric mixer because of that factor. As far as the dough, the stickiness seems to largely depend on what you add in the way of cheese and fillings. With coarsely grated mozzarella cheese, the dough was sticky but slightly less sticky than when I made them with a pizza cheese blend, in which the cheese was more finely grated. Similarly, when I hand grate the cheese, it’s finally grated and the dough seems more sticky to me. Greasing one’s hands a bit does help, but if necessary one could add a little more tapioca flour to remove some of the stickiness. 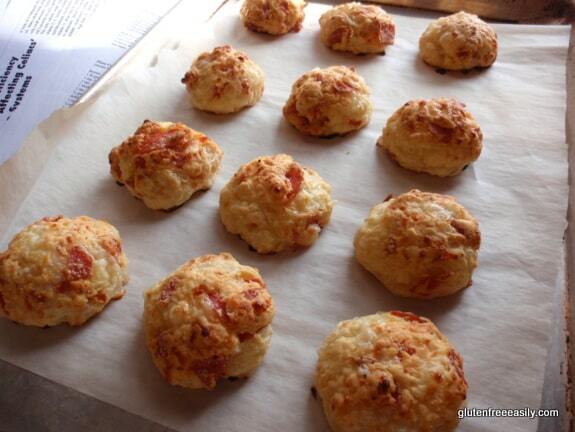 We love Chebe cheesy bread, so I know we’ll love these too. I’m going to make these for my daughters’ sleepover. Thanks for sharing! Ah, I missed that class, Debi. Very worthwhile tip though! Hormell sells pepperoni minis for salads and pastas. I bought a bag at Kroger. They are very small and inthink they would be a great size for the pizza bombs. It may eliminate any chopping. I made these today using potato starch because I didn’t have tapioca and I wanted them right away. They were still delicious! A little heavy, but who cares… I added pepperoni and more spices than the recipe calls for. I’ve made these minus the pepperoni, but I’m gonna have to do this for the boys! They will flip out! I think this will be perfect for a fun Friday dinner! Hey Sarena–I think you are right about all … making them for the boys, having them flip out, and being perfect for Friday night dinner. 🙂 Hope they are met with approval! Hi Shirley. Just wanted to let you know that I bought Chebe Cheese Bread mix and made it the other day. My husband said they were good but he liked this recipe better! I have a batch in the oven right now and next time I’m going to try them as breadsticks and see what happens. These are so easy and addictive! Thanks for the recipe. I made these three days later with just italian seasoning and minced fresh garlic (from bottle). Oh My! These are great little dinner rolls. I love the asian market! I found some of the glutinous rice flour and adding a small amount of this to your flours makes your breads/doughs very similar to the real thing! ends up making stuff very stretchy so you don’t need much! My fav. gluten free flour yet! I made these for dinner tonight, Shirley. My kids LOVED them! I did use ghee and Daiya cheese and they turned out great!! Julia said it was a new “culture of awesomeness” 🙂 We’ll definitely be making them again (and easier than making pizza!). We talked about how great these would be for football games (Superbowl parties) or other kinds of parties. I did double the recipe, used the Wildtree Pizza Sauce Seasoning, and to save some time (and messy hands), used my Pampered Chef “scooper” thing to measure out the dough and release on my baking sheet. Fast and easy!! Thank you thank you thank you. I fixed theses tonight for our 1, 4, and 8 year old with feta and black olives instead of pepperoni and it was the first time in ages that there wasn’t any complaining that, “that’s not what I want to eat!” There is a request now to replace taco night with these. And they live their tacos! Going to try some sweet versions and also a breakfast version as well. Thanks again and we look forward to new recipes. Hi Kevin–Welcome to gfe! 🙂 And thank you for taking the time to leave this wonderful comment here as well as messaging me on FB. I so appreciate your great feedback! It make me so happy to know that these Pizza Bombs were a hit with you and your kids. And to have a request from them to replace Taco Night with Pizza Bomb night … well, that is high praise indeed! A breakfast version will be easy to make and terrific no doubt. I’ve made one sweet version here—Chocolate Bombs—but it is not super sweet. You might have something else in mind. 😉 Please report back if you have success with your new variations! And thanks again! Thanks so much for taking the time to comment, Jenny! Hey Shirley! I just made these for my husband’s Superbowl birthday party! 🙂 His favorite pizza is BBQ Chicken, so I used shredded chicken, green onions, garlic powder & his Daiya cheese (cheddar)! I had to add a bit of almond milk to be able to stir it & then spread the mixture in a small pan. After baking I cut them in strips & we dipped them in barbecue sauce! They were SO good & the birthday boy loved them!! Can these be made ahead or do you have to eat them the same day? Hi Maria–Welcome! I like these best fresh out of the oven, but we always eat the leftovers warmed up or cold so, yes, you can make them ahead. I find them to be a little bit chewier the second time around, but still delicious. Hi Brenda–First, since this is your first comment, I’d like to welcome you to gfe! 🙂 Second, yay, on this recipe being one of your kids’ favorites—love that! Last, you had me laughing on the flying saucers! Hey, whatever works. Crispy edges and savory middles definitely sound delicious to me. Like you, I do love a versatile recipe! 😉 Thanks so much for taking the time to comment and share your experiences—both the expected and the surprising—here with us all! I wanted to let you know I only had 1/4 c. Tapioca flour, so I subbed 1c. Soy flour. They turned out perfect! Quite frankly I think my and my husband’s favorite new Saturday night dinner. Thanks for the great gf recipe! This the first doughy thing we’ve eaten in long time. These were great! The kids and I both enjoyed them. The combination of tapioca and mozzarella cheese make a great traditional bread like crust! These have become a lunch box staple. We have found that the freeze well after baking and thaw before lunch. They make a geat lunch with sliced cucumbers and peppers and some apple. Fresh out of the oven they are great too. I make them small like an appetizer and I almost always make a double batch. Hi Karen–Thanks so much for taking the time to comment and leave this fantastic feedback! These tips will be helpful info to so many reading. 🙂 And I don’t think I’ve ever welcomed you to gfe. I’m so happy to have you here! 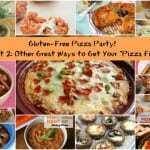 I’ve recently taken these to a couple of social gatherings, and I’ve gotten a lot of positive comments from my friends (who aren’t gluten-free)! Thanks for the great recipe! Oh my goodness! These things are “da bomb!” Pun intended! Made them dairy free using the Follow your Heart cheese substitute and Earth Balance Margarine. Hi Michelle–Yay!!! I’m thrilled this recipe worked so well with your dairy-free substitutions. 🙂 Thank you for taking the time to comment so that other gfe readers will know they can easily make this recipe dairy free and that they will love the results! Pao de Quejo is the best as everyone loves it…regardless of dietary restrictions! I have always cooked mine on the stove, so I am eager to try a version that skips that! So creative to put the pizza toppings right in the mix! Tessa–I’d never heard of making Pao de Quejo on the stove top so I had to look up the directions. That method with its concern about the mixture boiling over would stress me out! These are super tasty treats. I think I need to make some tomorrow to ensure my Monday goes well. 😉 Have a good week! Hi Karen–I’m so sorry to hear about your experiences. I’m baffled because I’ve had dozens and dozens of comments from readers reviewing this recipe and all have loved them and had great results, often even substituting other ingredients. Did you make any changes to the recipe? What brand of tapioca flour did you use?